As Australian cities expand, reconstruction on small inner city blocks becomes increasingly demanding and challenging, and concrete walls with their inherent value of providing an acoustic, thermal and fire resistant barrier close to the boundary are solving the problem. 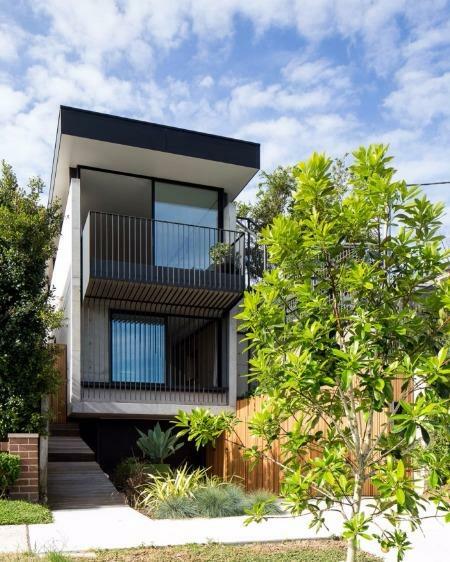 A small building block six metres wide by thirty six metres long with a great location at Bronte in Sydney normally doesn’t afford a large footprint for a comfortable home, but using concrete walls close to the boundary and construction over three levels creates an expansive haven. Small inner city residual blocks create special building challenges and this one was no exception. A normal single residential building block will often have just three common boundary neighbours, but this block despite its miniscule size has eight boundary neighbours. 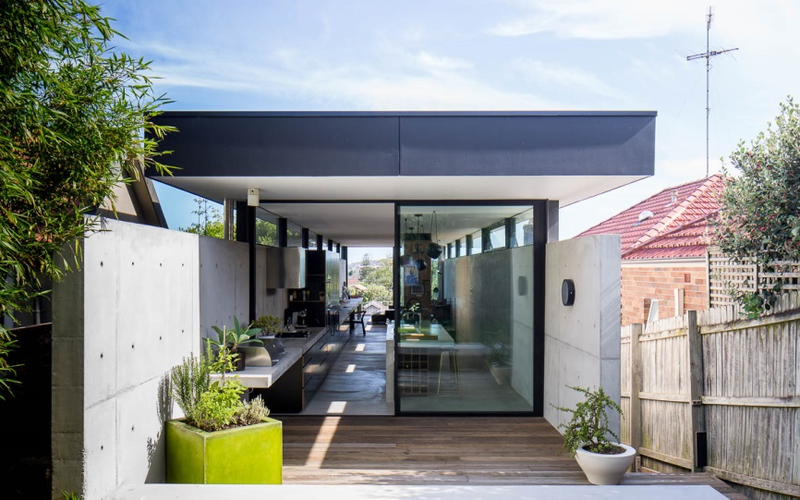 This creates eight separate neighbours to keep happy with the building process and the council development application – and concrete was instrumental in building the owners their dream home while satisfying the concerns of the neighbours. Concrete external walls have the ability to be built close to the boundary line while providing a neighbour friendly sound, thermal and fire resistant barrier – an essential ingredient in producing private living areas in close quarters. Additionally concrete has the ability to provide a waterproof and termite proof external wall in subterranean conditions which is essential for construction of basements. This building site had the additional challenge of managing a sloping natural ground surface which led to the provision of a partially underground garage with street level driveway access. Using a concrete floor constructed in conjunction with insitu cast concrete walls creates the ability to build water tight below ground structures which is essential for basement construction. The result: off street undercover garage parking provided on a 225 square metre inner city block – concrete is working miracles for urban building. 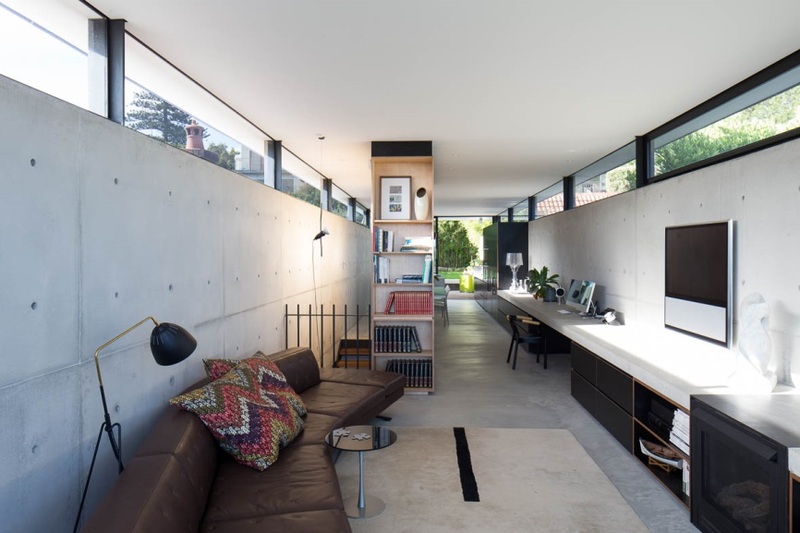 Internal privacy for the owners was protected by designing the concrete external walls 2.4 metres high with continuous glazing 550 mm above the concrete wall. This allows open natural illumination while maintaining internal privacy – a great advantage in close urban living. Concrete floors have a lot to offer for energy conservation. Clean efficient heating of the house was provided by hydronic heating elements cast into the floor of the house. As heat rises the most efficient method of heating takes advantage of this: locate the heat source at the bottom and let the heat rise naturally throughout the room. Concrete floors have the unique advantage of being able to incorporate heating elements integrally in their structure. For this design the floor consisted of a 100 mm concrete overlay incorporating the hydronic heating elements. The overlay was constructed over the top of a supporting 100 mm structural slab. 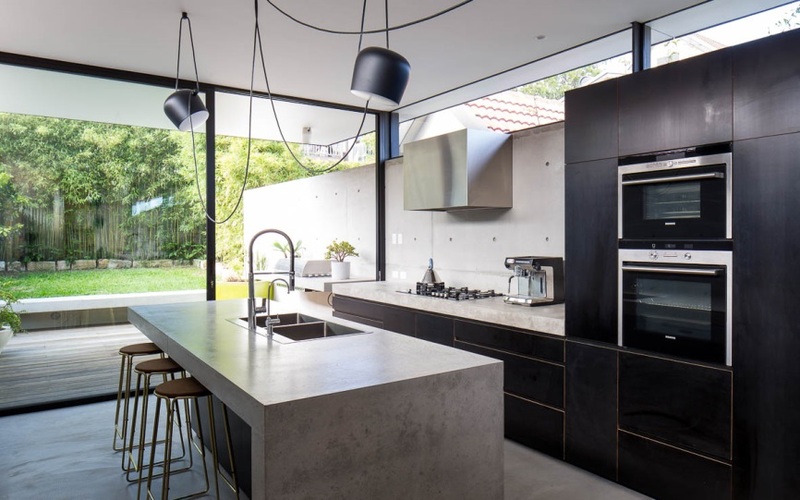 Concrete has the additional energy advantage of being able to store heat passively creating a home that has an even and stable temperature throughout both winter and summer. Internal heating of a heat storage floor with a bottom up heat flow pattern results in an energy responsible, economical and efficient winter heating system. The external concrete walls were constructed as an attractive feature of the facade of the house. Extra attention was paid to the line and symmetry of the salient visible features being the tie-bolt holes and form board joint lines. This ensured that the geometric alignment created a pattern that was pleasing to the eye. The architect drew construction drawing set outs detailing the position and alignment of wall ties and form boards and the extra effort on the drawing board pays dividends in the visual appearance of the walls. With thought and planning to the detail of the visible features in a concrete façade the concrete walls become an enduring visual treasure. The owners of the house were so pleased with the appearance of the concrete walls that they went on to make furniture items from this wondrous material. A stunning kitchen island bench and a side wall mounted bench were also manufactured by the builder in concrete. Horizontal concrete surfaces for benches are produced by repeated steel trowelling of the surface to produce a smooth, hard, dense burnished finish and with the subsequent application of a chemical concrete sealer become an impervious robust hygienic surface. Concrete continues to solve the problems posed through increasing land scarcity in our cities. Concrete walls provide a neighbour friendly sound, thermal and fire resistant barrier and concrete builds an economical and thermally efficient home that is great to live in, view and admire. Concrete is a valuable building resource that continues to provide home, shelter and style for countless Australian families.